The new “Ocean Coral Spring by H10 Hotels” of approximately 120,000 m2 of construction, will be an avant-garde complex with an imposing design composed of two phases, a wide range of entertainment spaces for all ages. SANTO DOMINGO, Dominican Republic, March 25, 2019 /PRNewswire-HISPANIC PR WIRE/ – Grupo Therrestra, under the leadership of Engineer Hugo Pérez Ovalles, continues to intensify its presence throughout the entire Caribbean region with the execution of the new project “Ocean Coral Spring by H10 Hotels”. This project represents a new sign of success for the group which specializes in Design, Construction and Supervision, recognized in the region for executing tourism projects of the most demanding and high end hotel chains in the world with quality and within a short period of time. 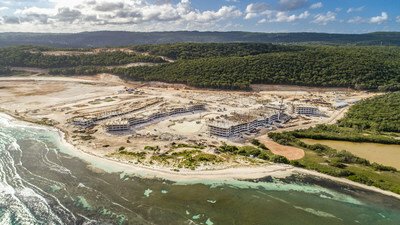 For the New Ocean Coral Spring, Therrestra will employ values that characterize the organization, which are: talent, adaptability and the confidence that H10 Hotels placed for the development of 957 rooms to be executed in two phases with a total of approximately 120,000 m2 of construction. The first phase, with 75,000 m2 of construction, will conclude by the end of 2019 and will have 513 rooms in an urbanized environment with an impressive main building which has a great Gastronomic offer, Theaters, Convention Center, Bowling area and others. Will also have a luxurious Spa and other 14 service buildings to enrich the experience. The second phase, with 45,000 m2 of construction and 444 rooms will be the ideal environment for adults and it is scheduled to open by the end of 2020. Will have a main building and a lobby along with thematic restaurants and other specialized suitable areas for an environment to rest and relaxation. The president of the Group, Hugo Pérez Ovalles, is thankful for the confidence deposited in Therrestra by the hotel chain, affirming its commitment with the development of high-quality projects and to continue being an ally of the tourism sector with the execution of hotel projects that exalt the Caribbean as an elite destination. Satisfied with the projects carried out to date and grateful for this new challenge, Perez Ovalles confirmed that “The new Ocean Coral Spring by H10 Hotels is called to be a World Leader in tourism in the Caribbean and we are proud to be part of this initiative”.